The Regional Peace and Order Council (RPOC) of Region 1 has cleared a Pangasinan lawmaker and two La Union mayors from President Rodrigo Duterte’s narco-list. The RPOC resolution recommended that the names of Pangasinan 1st District Representative Jesus Celeste and Naguilian Mayor Reynaldo Flores and Bauang Eulogio de Guzman III be stricken off the narco-list. The RPOC said “there is no evidence” that the three politikos had any involvement in any illegal drug activity. “Upon deliberation and after intensive examination on the results of the different investigations conducted by the Philippine Drug Enforcement Agency (PDEA), Philippine National Police (PNP), National Bureau of Investigation (NBI), Military Intelligence Group (MIG), National Intelligence Coordinating Agency (NICA) and the Department of Interior and Local Government (DILG), this Committee has arrived at the conclusion that the following drug personalities and narco-politicians be recommended for delisting from President Duterte’s narco-list,” the RPOC resolution stated. 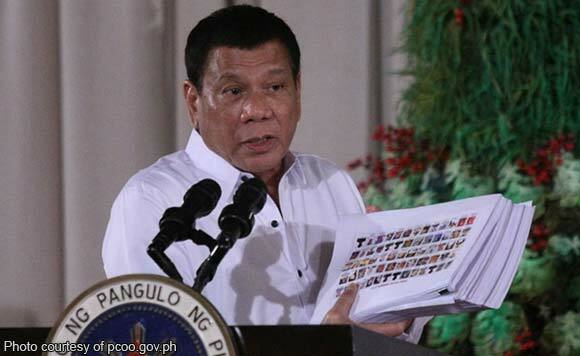 Duterte earlier named four La Union politikos in his narco-list including slain former lawmaker Eufranio Eriguel and Tubao Mayor Dante Garcia.